It may take a few months, but it looks like Aleppo is primed to fall to the rebels. After months of painfully incremental progress, the rebels have made a major push in the south and appear to be circling around towards the artillery base and military academy at lightning speed, while seemingly halting regime advances in the center of the city. 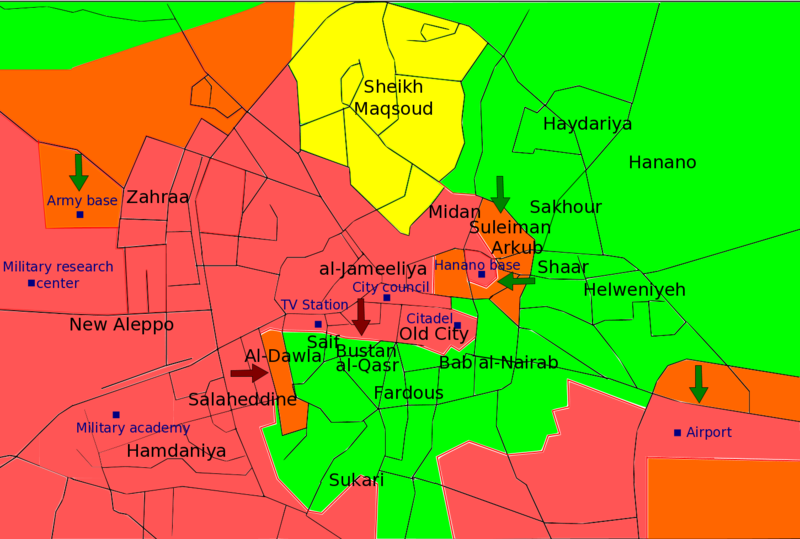 The airport is cut off and encircled--it will fall, freeing up forces there to push west. The good news: Ending the fighting in Aleppo will bring relief to citizens there and likely grind down the administrative capacity/legitimacy of the regime (it would be like the US losing New York). The meh news: The regime won't walk away; it will simply retreat to protecting the western parts of the country where it is stronger. The bad news: extremist Islamists make up an increasingly large and influential portion of the northern rebel movement (where the south is more controlled by the moderate/secular FSA)--if the regime does fall, there is likely to be an ongoing war between the FSA and these Islamist extremists (as well as an ongoing sectarian conflict). The excitement around the Arab Spring, including relative madness in Libya, Syria, and Egypt over the past few years has pluged America's forgotten war (need I mention that it's Afghanistan?) into even deeper obscurity. Even I know quite little, but a discussion that exposed how little I know prompted me to become a responsible citizen and learn a bit more. I'll share what I've learned (and some of what I knew already) here. What I must first state is that this post is, for me, far and away my most researched, and most painfully considered, but it shall be far from a triumphant magnum opus. I say "painfully" with literalism. I have found Afghanistan to be inscrutable, and trying to figure out what is truly going on in the country has proven completely elusive. At this point, I can only provide many contradictory leading indications and try to provide some guidance on which ones are most worth paying attention to. I hope it provides some clarity, but I must insist on managing expectations: one is likely to walk away from this post at least as frustrated as one is enlightened. I mostly wish to answer the following question that my girlfriend sharply engaged me on for the past week or so: "What's going to happen after NATO withdraws from Afghanistan in 2014? Will it all fall apart; was it all for naught?" After incredible amounts of frustration, spiraling pessimism, blips of hope, and some near giving up, a consensus is building in my mind. I'll state, tentatively, thus: "It won't be pretty, but the Afghan government will hold and the country will move forward." Let's start digging into why. 1) The Taliban are surprisingly strong, and many are fighting as "nationalists." Despite being outnumbered 35,000 (or so) to 485,000 (of which 380,000 are Afghan National Security Forces [army and police]), the Taliban maintain extensive influence & administrative control over the southeast of the country (but I have found no reliable estimates of territorial control since 2011) and can be found making trouble of some sort nearly everywhere except the most central and north-central parts of the country. Of the Taliban interviewed by the Asia Foundation, over half said they were fighting primarily to expel foreign troops from the country. 2) The Taliban manage to keep on recruiting. 75,000 Taliban or allied fighters have been killed since 2001--but their numbers have largely grown over time (from some 400 in 2002 to 10,000 in 2004, etc). 3) The people of Afghanistan are shockingly confident in their government and their future. Between 2008 and 2012, the proportion of Afghan poll respondents that believes the country is going in the "right direction" has actually increased steadily from a low of 38% to a recorded high of 52%. Additionally, 93% have a "confident" or "very confident" view of the country's security forces (though we'll see later that this optimism might be a bit unsubstantiated). Survey-reported access to electricity, security (! ), drinking water, and education have improved, fueling this optimism. This satisfaction has led to 75% of respondents giving the central government's performance a "positive" assessment. 4) Many parts of Afghan life have improved, but corruption is a major risk for the Karzai government. On the other hand... about 80% of respondents say that corruption is a "major" problem in Afghanistan and over half experience it in their daily lives. Over 1/3 have had to give bribes for various services, including healthcare, justice, employment, and education. 5) Numbers don't tell the whole story on Afghan national security forces--and the rest of the picture isn't very pretty. The Afghan National Army (ANA) has a highly varied level of readiness. Only 14% of Afghan soldiers are literate to a first grade level (Source: GAO), and desertion sits at 30% or so for the year of 2011. Drug use amongst soldiers may be about 50%. There are multiple anecdotes of ANA soldiers fighting well against the Taliban, and many others attesting to whole units being paralyzed by fear and American advisors being unable to rouse them to fire their weapons. Generally, the Afghan National Army, despite being much larger than its Taliban counterparts, is less disciplined, less experienced, less skilled, less hardened, and far less zealous in many patches, meaning that there is a risk that certain brigades of the ANA could be quickly routed by smaller Taliban forces in a post-withdraw civil war. 6) Afghans want the Taliban and foreign troops out of their lives. 81% of Afghans are in favor of a negotiated settlement with the Taliban. 65% "oppose" the Taliban and 30% are "sympathetic" to or "supportive" of the Taliban. 75% of the same respondents said they felt fear when meeting ISAF troops--this is about the same percentage as those that are afraid of the Taliban. In 2009 (BBC Poll) only 4% of Afghanis wanted the Taliban to rule the country and I don't believe it's changed much since. 8) Afghans are surprisingly liberal and progressive in their politics. 84% of Afghans believe that democratic elections are the most just way of choosing leadership; 83% believe that all people (regardless of ethnicity, religion, or gender) should have equal rights under the law. Almost 90% believe that women should have equal education opportunities (but only 2/3 believe women should be allowed to work outside the home). In some ways there's a lot more to it than that, but most things are variables under those (like "understanding the terrain," "cash on hand," "determination," etc, might all be a form of military capacity/capability). As we see in our facts above, the Taliban don't have the military advantage at all (they are vastly outnumbered, outgunned, and outmatched across the board by NATO troops and consistently fail quite miserably in open battle). No doubt, their sanctuary in the Pashtun parts of Pakistan has been critical to their ability to organize and avoid destruction at the hands of NATO, but they must ultimately be in Afghanistan in order to have as much influence as they do. We see also that they're just plain not supported. While some are sympathetic to the Taliban (as they're the primary anti-foreigner/nationalist group in the country), Afghanis don't want them back in charge. Thus they should not have the ability to "swim among the populace" as successful insurgencies in the past have done (China's Red Army, Vietnam's Viet Cong, US Revolution, etc). Given such low levels of support, we'd expect the Taliban to have to exert influence through very overt measures, and through force, and thus be unable to "hide" from NATO/ANA troops. So the Taliban just plain don't have the usual strengths that contribute to success, even though they've been a persistent and partially successful insurgency. This has bothered me to no end and, sadly, I do not have any silver-bullet answer, but there are a number of unconventional factors and strategies that may contribute to the Taliban's strength. The Taliban fight their war these days largely through targeted killings. Despite their seemingly low support rate, their intelligence is quite good, and they are able to intimidate citizens away from overt government support by credibly threatening to painfully murder them and their families. IEDs are going to be threatening to NATO troops but ultimately won't win the war against the Afghan government, but successfully coercing people to act on their behalf can. To beat this, the Afghan government's police force must become credible enough that people feel much safer reporting intimidation than following its lead. Geography helps the Taliban rack up lots of "territory" if we look at maps of where they act. Rural areas are incredibly sparse and NATO/ANA forces can't track the Taliban through cave networks/etc in rural areas. The Taliban are able to hide here and exert influence in nearby villages while avoiding patrols whenever possible (and using IEDs to disrupt them). It makes elimination a very difficult proposition... but ultimately, it can keep them around and can drive out foreign troops, but this alone won't allow them to take the country back on its own (as urban centers do count for a significant portion of the population). Obviously the Taliban have sanctuary in Pakistan--without this, they would have been quickly destroyed in late 2001 and simply never been able to mount a comeback. The US drone program is designed to target this but obviously Taliban leadership like the Quetta Shura (the top leadership council), Mullah Omar, Haqqani, etc enjoy sanctuary there. Additionally, Pakistan allows for the funneling of foreign troops to keep Taliban/ally ranks full. Pakistan's ISI is probably funding/supporting the Taliban (though this is a bit of an "unholy alliance"). The ISI's actions seem to be highly self-contradictory (sometimes funding and sometimes attacking/arresting), but if we recall that there are many faces of the Taliban and that it is largely a cell-based organization, the ISI will support some cells and be angered by others. The ISI is very interested in maintaining influence in Afghanistan and in the past did this quite directly through the Taliban. Thus the Taliban has intelligence, training, funding, and other organizational advantages from the ISI that allow it to frequently outsmart NATO/ANA troops. Determination: the Taliban have an edge in determination that the ANA does not, and this has a chance at being the decisive factor in a 2015 civil war. The Taliban will easily fight to the death, where ANA troops lack the fervor or zeal of religious extremism--and the discipline of Western troops--and thus are prone to give up in a fight more easily. Finally: the gap between 4% (want the Taliban in charge) and 30% (sympathetic) is large, and is due to some other appeal the Taliban have besides their monstrous form of rule. But statistics above give us the numbers: 75% of Afghanis are afraid of Western troops and over half the Taliban see themselves as primarily fighting against foreign troops. This nationalist appeal gives them some tentative support where they might otherwise have none. Taliban attempt full takeover: Outnumbered some 11:1, the Taliban would have to fight their way through huge ANA forces entrenched in towns/cities throughout the country in order to make serious headway. The ANA is equipped with some elite offensive capability that should be able to counter-strike against any towns that might fall to a larger Taliban force, so the Taliban would have to move with relative speed. The Taliban would have some major successes, and likely establish a working influence over significant swaths of the country in the south and east. But ultimatley, if they can't suppress the ANA's ability to launch offensives, they may be in trouble. They don't enjoy much support outside of their homelands, and much of the support (and manpower) they have is dedicated to booting foreign troops, who will be gone after 2014. ANA troops will likely be more welcome in a village than Taliban for most of the country, giving them a real leg up. The ANA might even be able to hold on to the vast majority of the country, and relegate the Taliban to the southern 10-20% (like the FATA in Pakistan). Taliban negotiate: Fighting will continue, along with the fiercest spring offensive yet, but it will be due to the Taliban "going all in" rather than suddenly becoming a lot stronger. They will go all-in in order to maximize bargaining power at the negotiating table. They will likely demand constituational changes in addition to some guaranteed representation. They want Karzai out, but there will have been a new election in 2014, and if that president enjoys lots of Pashtun support (as Karzai did at least in 2004), the Taliban will have trouble convcincing him that he needs to step down. Ultimately, the ANA won't be able to clean up the Taliban (if they can't with NATO support, they certainly won't be able to on their own), so a negotiated settlement is really the only way to end the war. The Taliban know this and also know that they have more tolerance for continued war and death than the citizens of Afghanistan, so they'll have suprisingly strong bargaining power and will likely walk away with a frustrating amount of concessions. I decided that, despite many contradictory indicators (on one hand, Taliban strength/wide influence vs ANA lack of discipline; on the other hand, low Taliban support and high optimism for the future), I would give the final say on the likelihood of the future to the people of Afghanistan. At the end of the day, if people feel more secure, it's because the police and military forces are becoming more effective and trusted, which in turn means that they'll be sufficiently integrated with the Afghani population to be able to cooperate in security matters. Security has improved for Afghanis, and they are becoming increasingly attached to their government, thanks in part to better education, infrastructure, and health, and increasing security (and thus real protection of some basic freedoms and rights). If the Afghani people really buy into their government and work with their police force, the Taliban simply won't be able to take serious root--they don't have the manpower to overwhelm the ANA, even if it is very shaky in many patches. They'll lose recruiting power as foreign troops leave, as many of their fighters just aren't as interested in extremist Wahhabism as they are an Afghanistan free of foreign occupation. The government is actually making progress in "building the state" and creating a "critical mass" of security and support to weather the Taliban storm. Afghanistan isn't Vietnam. In Vietnam, the NVA enjoyed overwhelming popular support, the population was fully part of the war (against the South), and the Saigon government was seen for what it was--a weak puppet. The Saigon government could not have administered the country even if it could have fought off the NVA. In Afghanistan, the picture is different. The insurgents are unpopular, the people of Afghanistan are fairly liberal, and they approve of their legislatures at over 70% (compare that to the 11% of the United States' approval of its own congress). The government risks being a long way from being able to administer large parts of the country, but it doesn't mean the Taliban have a heck of a lot better chance outside of their traditional homelands. When NATO leaves in 2014, more blood will shed, but the long-term picture for Afghanistan looks... not so bleak. By 2020, there will be many worse places to live in the world (sadly), and I think the territorial control line between the ANA and Taliban will have stabilized enough that the fighting will be minimized, and the Taliban won't be able to run the country. Wikipedia's primary contributor to the Syrian Civil War page, futuretrillionaire (whose identity is unknown to me) has been building neighborhood-by-neighborhood maps of the Battle for Aleppo since September. Below I post four snapshots, each with a bit of commentary about what's happening and what may be next. 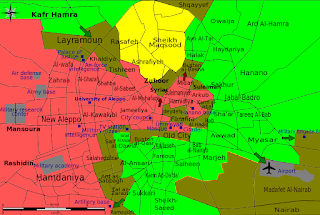 Late Sep 2012: Rebels press on multiple fronts, before Aleppo is resupplied. Mid-Oct 2012: Resupply and reinforcement of Syrian regime troops has denied rebels access to the international airport and driven them back from the main army base in the west. Counter-attacks occur throughout the front in downtown. 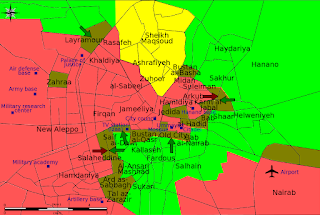 Mid-Nov 2012: Rebels push in from the northwest, attempting to push towards the critical air defense and army bases. The front line in the center of the city is a mess but is largely not moving. 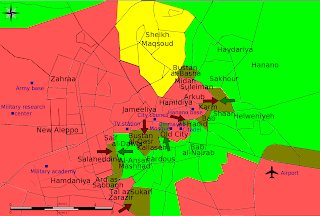 Mid-Dec 2012: Minimal movement of the front lines in the center of the city, which has become a meat-grinder. Painfully slow rebel progress in the northwest, attempting to inch towards the army base. At this point, Rebels have massively limited the regime's ability to reinforce and resupply Aleppo--predictions at this point were that Aleppo might be surrounded and fall within the next few months. Early February 2013: A long gap between maps because front lines just had not moved much. 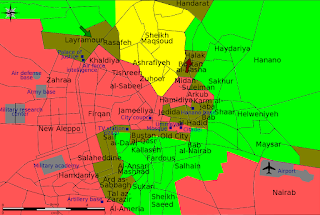 Rebels, in early February, make a massive push in the south and east (as of Feb 12, they may have broken regime defenses around the international airport, as well as seized another air base near Aleppo (not pictured on the map), but may abandon it if it's going to be bombed). 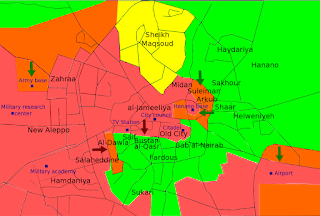 The regime, on the other hand, is pushing rebels back in the center of the city and seems to have a major advantage there. If the rebels can consolidate gains in the airport region and cut off regime troops there, they may be able to spend the next few months (yes, it'll be slow) encircling from the south and the northwest. It appears to be their strategy--the press into the southeast has been somewhat sudden and may signal a more sophisticated approach to trying to take territory--fighting on these outskirts will be quicker and less deadly than in the center, and these outskirts hold more military bases, including an artillery base (currently under threat of capture by the rebels), military intelligence, an air base, an army base, and the military academy and research center--it's almost certain that each of these serve as strategic strong points for the regime, and would be much higher-payoff targets than city-center blocks (which are largely bombed out shells now) that they seem to be giving some ground on. I get a lot of requests for guest posts and am quite picky in what I put forward--this one I like a lot. My guest author today is from One Minute MBA, and they break down the economic complications of the Senkaku Islands dispute between Japan and China, going a bit deeper than I have in the past. They illustrate the story below, pointing out some of China's options if the US takes a stronger pro-Japan stance than it has now. 1) I think China's economic retaliatory responses are all much more painful to China than they are the US. The US does have a few options to move some of its outsourcing (to Malaysia, the Philippines, Vietnam, etc), and cheap selling of US bonds would cost the Chinese hundreds of billions--more than the damage done to Japan so far. 2) A boycott of US goods would hurt some key exporters and would likely prompt some US aid for some of the exporters if they would otherwise go under. If the US similarly boycotted Chinese goods, it would need to be selective. Consumer goods boycotts would hurt US retailers; industrial goods boycotts would hurt US manufacturers. 3) I must admit my previous post on the Senkaku Islands, framing it as a distraction, was ultimately wrong. Whether it was originally intended as a distraction (for I'm still not sure of another good reason why the Chinese would escalate it after so many decades) or not, it has become a mainstay of Chinese foreign policy that they're not currently willing to put down. 4) The Chinese are unlikely to let the matter go entirely. As Professor M Taylor Fravel points out in "Strong Borders, Secure Nation," (a book I contributed some research to way back in the day), Chinese foreign policy is focused largely on maintaining territorial integrity, which (to Beijing, at least) requires a very consistent stance on territorial claims made at the end of the civil war, based on Ming dynasty maps of Chinese territory. In Beijing's eyes, giving up on any of these (including the Spratlys, the dispute it India, and the Senkakus) opens them up to lower bargaining power on future territorial disputes of greater import to their ultimate security.